March | 2015 | Louis Grell Foundation - "Showcasing the Legacy of Artist Louis Frederick Grell"
During a summer family visit to Salt Lake City, Utah for a week in August, Grell took over a failed mural commission, hired two assistant’s, stayed several months, delayed his return to Germany to attend the Royal Academy of Fine Arts in Munich, to complete this very large mural that hung high above the crowds during the Utah State Fair in 1907. 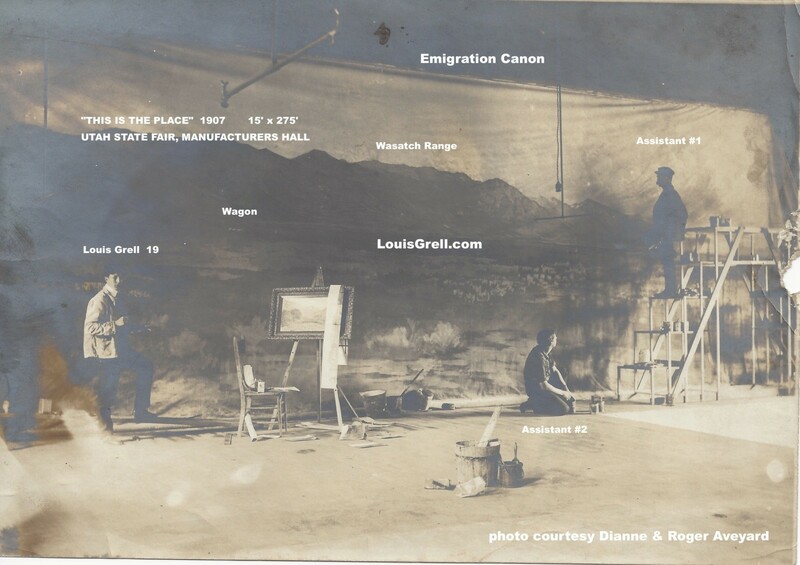 This is Grell’s historical depiction of Brigham Young’s famous discovery and statement, “THIS IS THE PLACE!” The current location and status of the mural is unknown to us. The Omaha World Herald reported it was 140′ long and the Topicks magazine by Albert Pick Hotels article stated it was 275′ long. Grell did his reluctant one interview, by phone, for the article which came out in May 1948. Notice the nicely framed study used by Grell as a reference.